Van Cleef & Arpels’ fabled universe takes us to Noah’s Ark and all its inhabitants. Together with three mythological creatures, Pegasus, the phoenix and the unicorn, they express the enchantment and richness of the Natural world in a splendid variety of precious, fine and hard stones. The Arche de Noé is a collection faithful to some of the Maison’s most dear realms: Nature, the brooch and the animal theme. Nature is represented by sixty couples of animals coming from every continent. 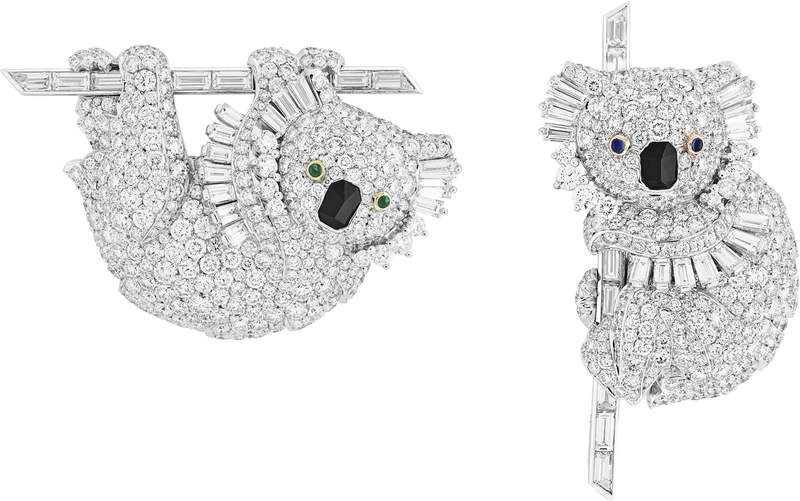 The perfect moment to refresh Van Cleef & Arpels’ animal range through the expression of love and affection, and of superlative High Jewellery savoir-faire . The animal theme is at the heart of Van Cleef & Arpels, whose clips and brooches inspired by this same theme can be traced back to 1910. Since then, the menagérie has kept growing, in an ode to lightness and movement. Whether alone or in couples, these creations renew a tradition that has been with the Maison since its foundation. To present this new High Jewellery collection, the Maison entrusted Robert Wilson, American set designer famed for his radiant, subtle, and thrilling conceptions, with the scenography. In his vision of the Ark, Robert Wilson imagined a sensory mise-en-scène plunged in the engulfing darkness. The constant screening of a video is reminiscent of the sea; the soft and enfolding piece of music evokes mystery; the skies darken as lightning streaks herald a storm, the Ark departs, and the ensuing respite hums like a promise of peace.